In Stock: In stock and available for shipping by next business day. Description: P-17 high heat resistant filler set-fast system has uses in aerospace, aircraft, automotive, tooling, manufacturing, and final fabrication where potential expoure to elevated temperature up to 446°F have to be tolerated either for short term or continuous periods. 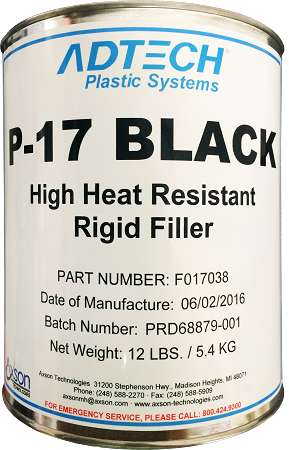 P-17 offers the user a smooth workable paste with set-fast cure to expedite those applicatios for repair or finish. P-17 can be applied with a squeegee, spatula, or flat tool. The cured material can be finished by mechanical sanding, grinding scraping, etc., to a heather edge. 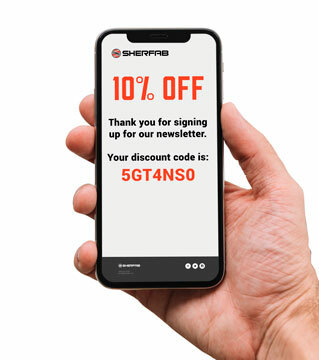 This filler has excellent adhesive and bond strength to fiberglass, SMC, BMC, RIM, FRP, epoxy, graphite and Kevlar composites as well as aluminum, plaster and other substrates. P-17 high heat resistant filler when cured and finished accepts virtually all types of coatings and decorative film without any blush or discoloration. Manufactured by Axson USA, Inc.
Special Handling Fee: This item is considered hazardous in volumes greater than gallon sizes and will include a special handling fee when ordered in individual units with volumes greater than a gallon. BPO Hardener is considered a hazardous material in any volume and can only be shipped by ground.